This month, 904Fitness highlights a local company that prioritizes health and fitness in a unique way. 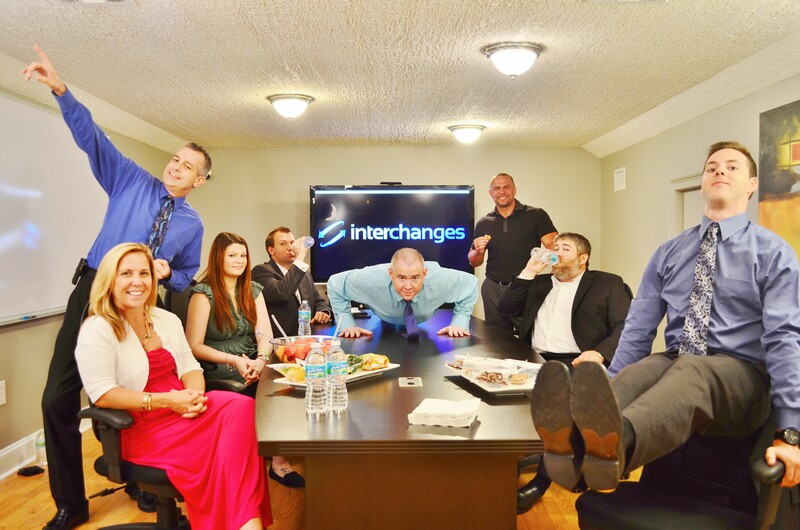 Interchanges is a Jacksonville-based, marketing company. They are a small business; they don’t have an in-house gym, a company workout t-shirt, or employee sporting events. What they do have – small health incentives and big potential. Speaking as a CEO, Chris Patterson talks about the little things he’s done right, taken steps to make nutrition easy at work and made time for mentoring. Interchanges shows us all how profound success really is the result of small, smart choices made consistently. Corporate health and fitness is an important factor in our success. We run a fast paced culture at Interchanges and it’s critical for each of us to keep health and wellness a priority. When our people get sick our business gets sick. It’s not an exaggeration to say that when the team is healthy so are our revenues and our customer relationships. There’s a domino effect: a healthy team leads to increased morale which leads to increased productivity and then increased revenue. Did you make time for exercise today? Did you make time to eat right today? Did you prioritize your health today? Did you focus on the positive today? Keeping fitness on people’s radar at work has an unexpected effect on their productivity. Making a place for health and fitness at work is invaluable – it maximizes work hours, boosts morale, reduces sick leave and even broadens network connections. Health and fitness can be a commonality that brings people together in all industries. I’ve tried to lead by example over the years by following the basics of health and fitness – clean eating, exercising regularly and hydrating. Contrary to popular opinion, I believe it’s easier to make positive health choices and stay in shape in America, more than ever: we have an abundance of healthful food, inexpensive health club fees open at all hours, vitamin shops, personal trainers and even gourmet nutrition on the go. There are even companies that will prepare healthy meals at incredible prices and deliver them to your office or doorstep. My personal choice for gourmet, fit meals is J. William Culinary. Leading by example should not be undervalued. It is a big role. In many cases, you are the mentor for other employees. This means you have a responsibility to know basic guidelines of health and fitness. People want personal attention. Being available and engaged to share ideas or offer advice is a valuable resource for employees. We pay for health guidance all the time, by hiring trainers and therapists. Be perceptive. Know when your employees are running on empty. Know when a good workout will be a benefit or a burden. You have to know where your team members are mentally and physically before offering mentorship. While healthy competition is valuable in the workplace, an ego can be damaging to relationships. When you are encouraging others to adopt fitness and healthful routines, you are part of something bigger than yourself. Self-consciousness disappears. Leading others to achieve big goals means you also must seek greater challenges to keep the flow. Pursue your individual fitness goals for the right reasons, i.e. because you enjoy the activity, and others will want to follow suit. Implementing wellness strategies at work is very doable. It’s not a monumental undertaking to make fitness a priority during the work day. There are literally dozens of small changes that will have a direct impact on employee health. At Interchanges, we encourage healthy meals for our team meetings. We’ve invested in a water purification system. We’ve keep fresh snack options in the kitchen. It’s not uncommon in our office to find health meals in the fridge. We welcome blenders for smoothies. I make personal, one-on-one time accessible to all employees who want to review health and fitness goals. One of the simplest ways to implement corporate wellness would be to add it to the agenda for your team meetings. I found that, for the most part, people appreciate the accountability and look at it as an opportunity for improvement. Wellness meetings take very little time and the results are substantial. creates a team environment, where we can encourage one another, help one another and celebrate victories. Finally, I think it’s worth noting that the employees who have been with me the longest and are the most productive are also the employees who are willing to accept advice on how to be the best they can be. Healthy employees equal employee retention and positivity in the workplace.